The following comments were amazing. Friends and family jumped in to re-assure me, and of course they were exactly right. I was blown away by their openness and encouragement. This morning, I re-read my post and wanted to share some of the responses to brag on the wise people in my life and to encourage anyone else who may be facing the same fear I was. Going from one to two (or more) – does the love really multiply? Kay – idk, mine came all at once, but I can tell you I don’t love one more than the other, they’re just different and special in their own way. … do I sound like The Bachelor? Sarah – Yes! Things change though, you will miss alone time with Hannah but you will also find time to have alone time with each child. Even more joy comes when they begin to play with each other. Vanessa – The love multiplies in such a way you can’t even imagine! With your first I think there is a lot of adjustment (at least there was for me) and I didn’t necessarily bond with him at first… but with the second, I’d already been a mom, had already known what it was like to love a child so deeply, that it was instantaneous. I agree with Sarah. You will find alone time with each kid, and I think that alone time becomes even more special and more cherished. Also, there is something unbelievably wonderful about watching your kids love each other. One of my favorite things in the world is hearing them laugh at each other. Peggy – I really struggled wondering about the timing of adding a second child and if I was taking something away from J. Now when I see them playing together, talking, and holding hands, I know we did the right thing and I can’t imagine life without A. I am sure you will feel the same when they begin to interact. Dana – You can’t even imagine! Jan – definitely… the workload MORE than doubles… and God gives more than double the love — and grace. You know how you loved Brett before, and seeing him as SUCH a wonderful dad to Hannah makes you love him even more? That’s at least twice the love MORE than you had before… Love grows exponentially, which is ALL about multiplying, not adding!!! Chere – There’s no end to the love each human being can share! Jeni – I cried my heart out when I found out I was pregnant with E. Don’t get me wrong, it was a desired pregnancy, but I felt so guilty about D having to share our love. Thankfully the love really does multiply. But I understand how you feel. Laura – There is such a primal feeling of joy and love every time I see I and C playing and having a good time together that it it totally worth it!! 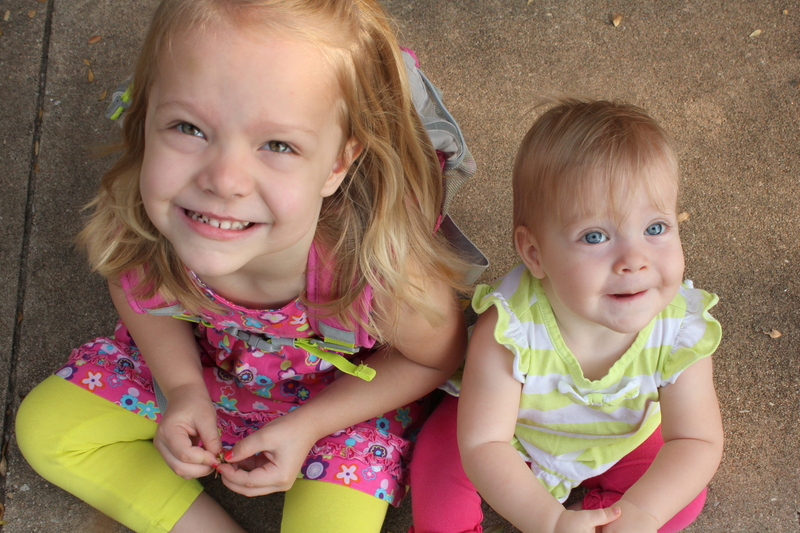 Kristine – While I went to two kids all at once, it’s so much fun having two little ones! The interaction between them is priceless. Kelly – It’s hard to imagine sharing motherhood. I notice that I hold onto the little things R says and does right now because I know that it will all change once his sister gets here. However, I have been reassured by every mommy of multiples I know that as soon as the second one arrives, the same love is there we felt the first time, and the family no longer seems complete without the baby. Jennifer – I remember crying my eyes out the night before my second child was born for just this reason, but Kelly is right. Your feelings are normal and natural. Also remember, bonding sometimes isn’t instant – it can take a little while, but one day very soon, you’ll have that same deep heart feeling for your new baby that you have for your first baby. Then you’ll feel just like Kelly said – you won’t be able to even imagine life without your newest family member. 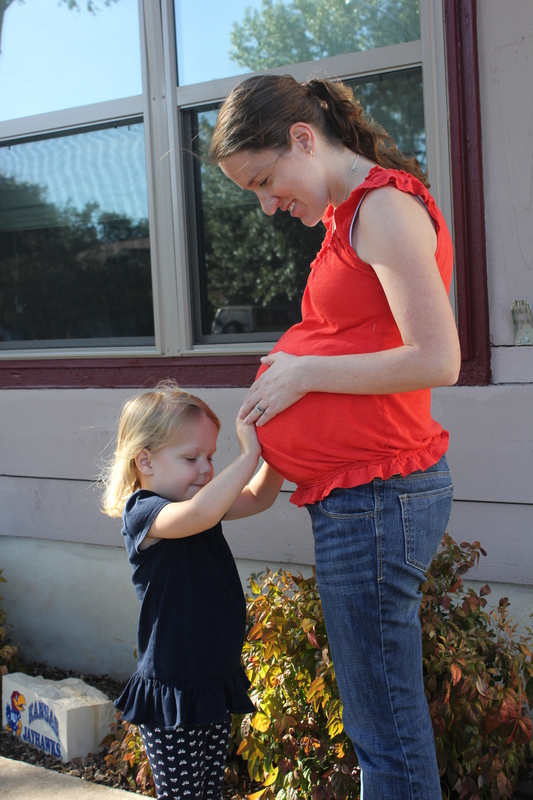 And my Grandma Ava – It is indeed impossible to picture how life will be when baby #2 arrives…. all the changes in your routine with Hannah and Brett. I can say that once the baby gets here, you’ll find it difficult to picture life without the new arrival. The same will be true as/if your family grows in the future. Each new baby is so precious and special. The family circle grows. Love knows no bounds. The comments were so personal and meaningful from the context of each person’s family – moms of many, twin moms, adoptive moms, math teacher moms, moms of big kids, moms of little kids. I know some pretty great moms. So, happy birthday, Violet! It’s been a wonderful year. You made Hannah a sister and multiplied the love in our family from the moment of your arrival.